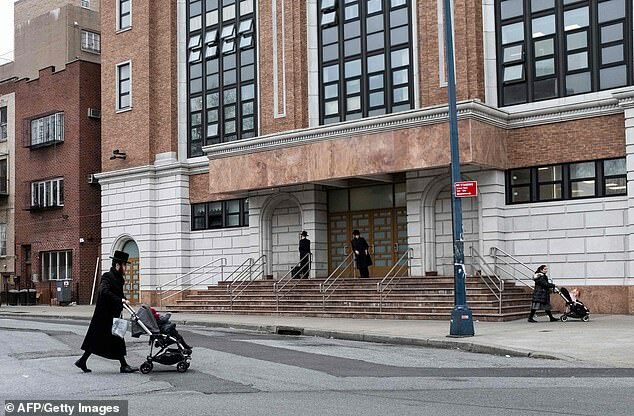 Five Brooklyn mothers have sued New York City for ordering mandatory measles vaccinations, accusing Mayor Bill de Blasio of unlawfully targeting Jews with an ‘arbitrary’ state of emergency. 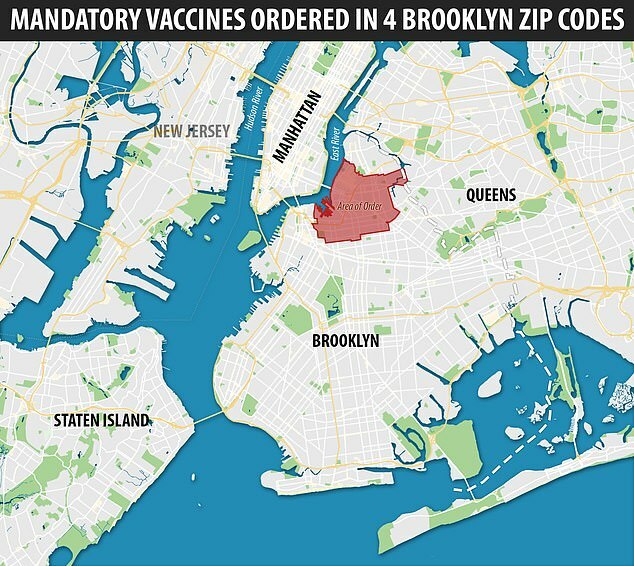 De Blasio declared a state of emergency on Tuesday, giving him the power to order vaccinations in four Brooklyn ZIP codes where 285 measles cases have been reported since October, particularly in the Orthodox Jewish community. Today, five mothers, with the support of five doctors and patient advocates, filed a lawsuit demanding the order be suspended. One of the patients advocates is Vera Sharav, a child survivor of the Holocaust and former librarian who has become a notorious vocal critic of the medical establishment and vaccines. In a strongly-worded affidavit, Sharav draws on her personal experience with anti-Semitism to accuse New York City of ‘totalitarianism’. What does New York City’s emergency measles vaccine order say? Last week, city officials said those who refuse could face fines of up to $1,000 or six months in jail, according to New York Senate emergency laws. New York City is one of the states that allows for people to skip vaccinations if they have a medical reason or a religious reason. When it comes to what constitutes an emergency, and how to handle it, New York state laws are broad. The mayor has the power to declare a state of emergency ‘in the event of reasonable apprehension of immediate danger’ or ‘that the public safety is imperiled.’ It can be declared for the entire city, or just certain ZIP codes. It can last for up to 30 days, or until the chief executive (the mayor) rescinds it. In this case, de Blasio says, it will last until April 17, though he does have the power to end it early or extend it. The law is broad about what measures the mayor can employ to bring an emergency situation under control. Whatever measures the city decides on, they become (temporarily) law. During the emergency period, anyone who violates the new rules is guilty of a class B misdemeanor, which carries a fine of up to $1,000 or a six-month jail term. Michael Sussman is the civil rights lawyer pioneering the case. He curried favor with the community after forcing a judge in upstate New York’s Rockland County to allow unvaccinated kids back at school despite hosting the state’s other major measles outbreak, with 168 cases since last fall. The Massachusetts precedent did not take religion into account because it was ruled before the Free Exercise Clause of the First Amendment was implemented in the US. Now, he says, the situation is different. As for whether this constitutes a state of emergency, that could be something of a coin toss for the judge whose desk this lands on, according to Tina Batra Hershey, JD, MPH, assistant director for law and policy at the University of Pittsburgh Center for Public Health Practice. While 285 cases is a small case-load in a city of nine million people, it is a lot for just four ZIP codes. But it depends how deadly the judge deems measles to be. ‘New York City law provides very broad authority for what qualifies as a public health emergency,’ Batra Hershey told DailyMail.com. ‘We have a disease that’s spreading rapidly, it’s a highly contagious disease, it’s hitting all those thresholds. ‘But there need to be scientific principles applied. Those pushing for the judiciary to side with New York City include Peter Pitts, FDA Associate Commissioner from 2002 to 2004, who believes there is no question on how dangerous measles could be. He is furious about the outbreak. Measles can develop into pneumonia, or encephalitis (inflammation of the brain), which Pitts warns could have a years-long impact on the respiratory system. ‘You may never be able to do athletics or walk properly or be able to maintain the average vim and vigor of an adult,’ Pitts said. Spluttering at the idea of ‘measles parties’ (where families deliberately infect their children with measles instead of vaccinating them), Pitts said he believes anti-vaxxer parents should be jailed. 2. Does the order unlawfully target religious group? Batra Hershey says the religious component may be a weak challenge. Although the 1905 Massachusetts precedent that allowed forced vaccines did not take religion into account, there are other rules that give New York City the edge. There is a dictum in the 2nd Circuit (in which New York falls) that allows judges to disregard religion in certain circumstances – and it has been upheld in New York before. In January 2015, the United States Court of Appeals used this dictum to side with New York City against Catholic parents Nicole Phillips and Fabian Mendoza–Vaca, whose kids had been excluded from school. Their children, who were not vaccinated on religious grounds, were excluded in December 2011 and January 2012 after a classmate was diagnosed with chickenpox. The judge ruled their exclusion was justified, relying heavily on Prince v Massachusetts. 3. Is the order counter-productive? Many public health experts say that, while the order is a valid move to contain the outbreak, it may have the side effect of driving anti-vaxxers further away from mainstream medicine and health authorities. ‘I do think this might be going a little too far,’ Batra Hershey said. ‘They [the city] haven’t done the quarantines or limiting movements that other places have. They went straight down this path that no other city has really done in a very, very long time. ‘You’re talking about making someone put something into their body. It’s not mandatory treatment, it’s mandatory vaccination. Indeed, driving factor behind Brooklyn’s measles outbreak is the circulation of a magazine called PEACH (Parents Educating and Advocating for Children’s Health), a religious illustrated handbook that demonizes vaccines with alarming drawings and storylines.